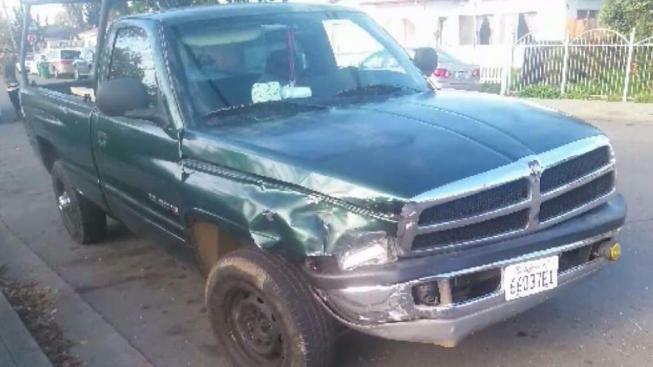 An officer in Hayward shot at a man who allegedly stole a truck from another man and also fired at the truck owner during a pursuit Saturday, according to police. One person was injured amid the chaotic string of events, and the 26-year-old suspect was eventually taken into custody, police said. The incident began around 5 p.m. when Stacy Jetton walked outside of his friend's house in Hayward and came across another man trying to steal his pickup truck, according to police. The suspect managed to escape in the truck, prompting Jetton to hop in his friend's car and chase after the suspect, according to police. Jetton eventually came up close to the suspect and demanded that he turn over the vehicle. "I pulled up right up to the back of him," Jetton said. "I said, 'Hey, that's my truck.' And he said, 'So and so, you' and pulled out a gun and shot. So then he took off and I didn't bother to follow after that." Jetton was not hurt, and he called 911 to have officers take over in hopes of catching the suspect. Officers eventually joined in the chase and witnessed the suspect smash into a number of other cars, leaving at least one person with minor injuries in the process, according to police. The suspect then started driving in the direction of officers, according to police. One officer opened fire, but the suspect was not hit or injured. A foot chase ensued, and the suspect was eventually found and apprehended, police said. Jetton's friend noted that Saturday's incident was not the first car theft to occur in the neighborhood in recent time.